By using TRANSFLO Express, you can have a trained cashier scan your paperwork and send it to United World Transportation. You hand your trip documents and the UWT Tripsheet to a trained cashier. Don’t forget to include your UWT deal # on your tripsheet (or provide this verbally to the cashier), this allows us to process your paperwork faster! The fleet ID to use for UWT is UWCL. The cashier scans the trip documents. For the typical trip, this takes less than a minute. The cashier prints a confirmation, staples it to the trip documents and hands all paperwork back. Your scanned delivery documents are transmitted to a data centers and delivered electronically to UWT. Your trip documents are available to UWT immediately for customs clearance, or for billing & payroll processing. 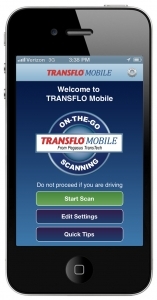 By using TRANSFLO Mobile, you can use your smartphone to send your paperwork to UWT, whenever and wherever you are. Go to either the Apple App Store, or the Android Google Play Store, and download TRANSFLO Mobile for free. Add the UWT “Fleet”. On home page click Edit Settings; Tap the “+” on the upper right hand of screen; add the UWT Fleet ID “UWCL”; click next. Add Your “Driver ID” which is your Carrier Company name, and tap Next. *Note: If you have multiple fleets set up, always remember to select your correct fleet before scanning documents. Start Scan. For optimal images, place document on a flat, dark surface and take picture in a bright well lit space. Quality check the image. After the cropping screen that includes the orange borders and hands, click “Continue” to accept the screen. On the following screen, double tap the image to zoom in. Check the quality on the image to ensure text and numbers are legible. If legible click “Accept”, if it is not legible click “Discard” and retake the picture. If you have multiple pages, simply take photos of all pages and submit when images of all pages have been taken. A unique Confirmation Number will be displayed on your phone screen and an email confirmation will also be sent. With Pegasus Transtech’s acquisition of TripPak, TripPak Mobile customers can migrate to TRANSFLO Mobile! In addition, the TRANSFLO Express truck stop network has expanded, and is now available at more than 1,000 trucks stops across the United States and Canada; this includes all Pilot, Flying J, Love’s, TA’s locations along with many independent locations. UWT charges a nominal fee of $1.00 per TRANSLFO transaction (wither Express truck stop scanning, or Mobile) that will be deducted from your final load settlement when we processes your payment, to help share the cost of this great service. This fee, which is lower than the competition, helps cover the administrative costs of processing your paperwork. Note that our transactions do not have a page limit. Also note that if you send multiple scans for the same load, you will be charged for each scan (1 scan = 1 transaction). Get on board with technology! Use our great TRANSLFO services today!